Enter the hostname or IP address in the text box next to the "Start" button, then hit "Enter" or press the "Start" button. Choose the desired interval from the "Interval" drop-down list box, on enter the interval in milliseconds into the list box. The interval must be an integer between 10 to 5000. You can	change the interval on the fly while pinging. Choose the desired packet size from the "Interval" drop-down list box, or enter the desired packet size in bytes between 1 to 65500. You can change the packet size on the fly while pinging. *** Note *** : Some hosts or routers may not support large packet size, in particular size larger than 1472 bytes. If a host or network does not support the selected packet size, you may get 100% packet drop rate. 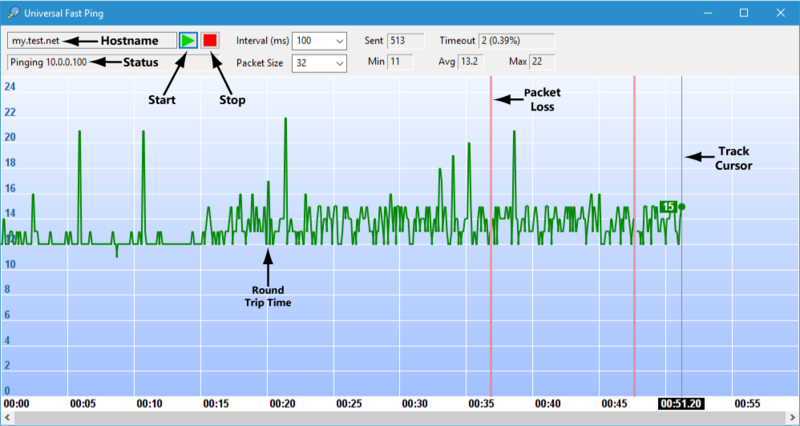 Universal Fast Ping plots the round trip time as a line on a realtime chart. It denotes periods with lost packets as red zones on the chart. There is a vertical line track cursor on the chart which follows the mouse, and can be used to read the exact round trip time at the mouse position. Move the mouse over the chart and use the mouse wheel to zoom in and out. You can also use [Ctrl +] or [Ctrl ↑] to zoom in, and [Ctrl -] or [Ctrl ↓] to zoom out. Drag the chart left or right, or use the scroll bar to scroll the chart. You can also use [Ctrl ←] and [Ctrl →] to scroll the chart. Universal Fast Ping maintains and updates the following ping statistics in realtime. The count and percentage of packets lost. The minimum round trip time in milliseconds. The average round trip time in milliseconds. The maximum round trip time in milliseconds. This software is based in part of the work of the FreeType Team.